Grant Assistance for Grassroots Human Security Projects (GGP) is a financial assistance scheme designed to meet the diverse needs of developing countries. This scheme was put together and managed by the Japanese government who collaborate with NGOs to deliver projects. The official handover ceremony of “The Project for the Improvement of Learning Outcomes through Upgrading Learning Facilities in Six Primary Schools in Laikipia North Sub-County”, a GGP project, was held at Mukogodo East, Laikipia North Sub-County, Laikipia County in February. The $92,945 USD grant went towards construction and renovation costs as well as much needed provision of sanitation facilities and purchase of classroom furniture. 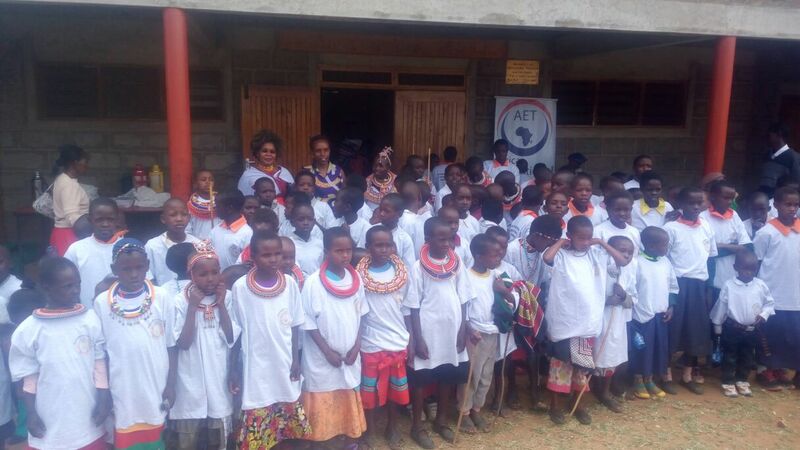 This project was implemented by AET on behalf of six beneficiary primary schools in Laikipia North Sub-County, specifically Chumvi, Doldol, Kurum, Kimanjo, Olkinyei and Ilmotiok primary schools. In our quest to enhance access to quality education for marginalised people, we have been active in Laikipia since 2014. Through our work in Laikipia North, we were able to identify the needs of these six primary schools in the sub-county. Prior to this, each of the selected schools were in dire need of desks with some only having two or three desks per classroom with an average of sixty pupils. This meant that the students had no other option than to sit on the floor, or rough materials like logs and rocks. The sanitation facilities were in deplorable conditions as many of them were in danger of collapsing and posed an immediate to risk to young students. With over 500 students enrolled at the primary school, the main beneficiary of the fund is Chumvi Primary School, their students will now have access to four new classrooms and a modern sanitation block thanks to the GGP fund. During the ceremony, the Headteachers from all the schools thanked Ms. Lucy Maina, Program Director of AET and the Government of Japan for their collaboration with AET as well as the funds. Large numbers of the local community also made an appearance and voiced their support. The Deputy Governor, Honourable John Mwaniki thanked the Government of Japan for the generosity in providing assistance in not only Laikipia but also in other counties in Kenya. Second Secretary of Japan to the Republic of Kenya, Ms. Yui Takashima, gave AET a special mention in her summary speech. She expressed her deep gratitude for our “tireless effort” and congratulated us for successfully managing and completing the project. Addressing the pupils, she proudly stated that she was glad to see their “beaming faces” which was proof that they were happy with the new facilities. She emphasised the importance of studying hard in order to improve their future prospects. In her closing remarks, she wished everyone good health, great happiness and prosperity.